Not my favorite, but still enjoyable. 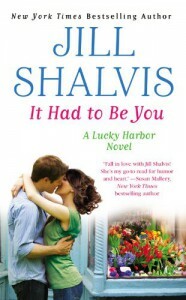 IT HAD TO BE YOU is the seventh book in the Lucky Harbor series by Jill Shalvis. I just found this series in 2013 and I'm seven books in at the end of the year. I guess it had to happen at some point, but this one fell short for me. Maybe it was because I didn't have that much invested int he characters like I have for previous books. I really had no feelings toward Luke or Ali at the beginning of the book. I'm not sure. I liked the story, I'm glad they got their HEA but for me there was something missing. I liked the mystery behind who stole the money and everything, but it just wasn't the same as everything I loved in the previous Lucky Harbor books. I'm hoping to get back to that in the next book, but we'll see.